FB Big Caslon adds six new styles to Matthew Carter’s familiar and beloved typeface. 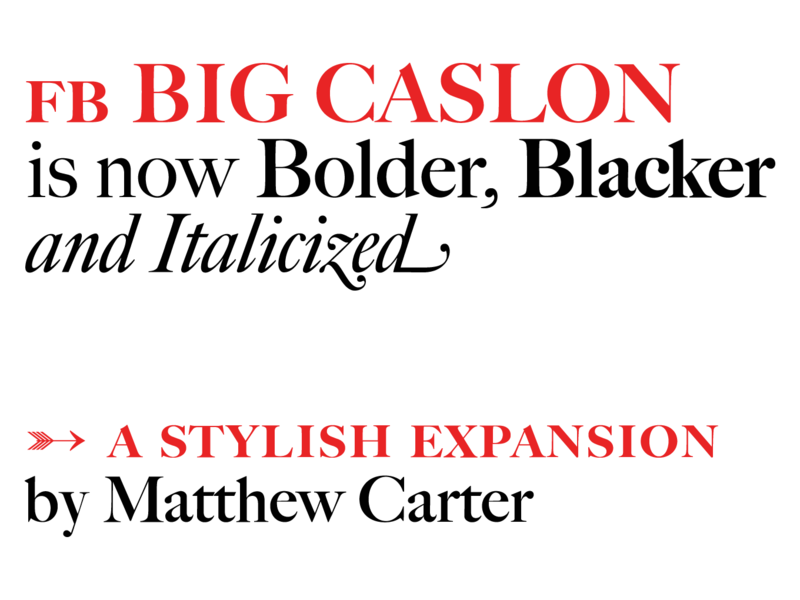 In 1994, Big Caslon was released as a single style, with separate fonts for small caps, expert and alternate characters. Now it is a fully-featured OpenType family, simultaneously available as webfonts, in three weights (Regular, Bold, and Black). They each have italics, small caps, and plenty of striking alternates. “Forceful and a touch eccentric”-that’s how the 1994 Big Caslon specimen described the faces that inspired Carter’s design. These new weights enhance its force, and amplify that dear eccentricity. But not for superficial gain, no, Big Caslon is still at its best in careful hands. Typographers who can sense the richness that Carter’s design offers will succeed by trusting these fonts. The fashionable swashes, set in Bold Italic. There are a number of swash ligatures that resolve cumbersome combinations, employed by default when ligatures are on. In 2003, Paul Barnes redesigned Wallpaper magazine using Big Caslon and for that Carter drew an italic with swashes. The distinctive serif, with its new verve, did not go unnoticed. Years later, Boston magazine was redesigned by Patrick Mitchell using early versions of FB Big Caslon, paired with our own Williams Caslon Text, by William Berkson. FB Big Caslon has many stylistic sets, from specific characters like the historical form of the h (stylistic set 8), to many flavorful ligatures, like the crossbar (ss10) and cursive (ss11) connections. A small sampling is shown above. License Big Caslon. Available in 6 Styles. FB Big Caslon is simultaneously available at Webtype.